Humans and Gorillas differ in many ways and climbing abilities are near the top of the list. Our technicians might not be authentic Gorillas but we definitely have sure footing. 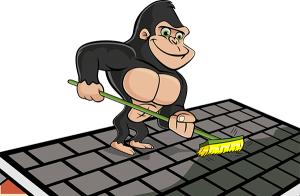 If you are looking for a helping hand for your Niagara Falls roof cleaning and moss removal, Gorilla technicians can climb that mountain for you. The two most obvious reasons that our clients call for our Niagara Falls roof cleaning and moss removal are: a) It has been a while or b) there is a visible issue. For most residential properties, the roof, or at least a section of it can be seen from the street level. A leaf here and there or rogue stick or branch is usually not enough to draw attention and that is why issues can fly under the radar for a while. By leaving roof maintenance out of your property care routine, you are opening up the door to a host of issues. Roof care is not only about looks! The aesthetic appeal might force you to take a second look but the benefits of your Niagara Falls roof cleaning and moss removal are structural as well! The most common needs for this service come alongside the changing seasons. By organizing semi-annual appointments for your roof maintenance, you can tackle weather-related issues. The fall season sees falling leaves and strong winds, dislodging debris from nearby plant life. Chilly winters might give a sleepy impression but there is still a lot of activity going on topside. Having a roof cleaning in Spring can help get rid of anything that has landed or built up while you were warm inside. The best defence is a good offence and our Gorillas are ready to play! Identifying an issue with roof clutter is the first step toward a clear surface but finding out which company will bring you the best results can be difficult. When you trust Gorilla with your Niagara Falls roof cleaning and moss removal, you are trusting your neighbours. All of our Gorilla technicians are local to your area, so we understand the issues that you are facing. Gorilla technicians approach your property with all the proper safety training and equipment. Once we are strapped in, it is time to clear that clutter. By removing clutter, it is possible to have a clear view of the surface of your roof. A clear view allows us to identify problems with moss growth and work alongside our clients to come out with a removal system that works.